A generation of American artists, writers and doctors headed to Paris for inspiration during La Belle Epoque. Hollywood film stars flocked to post-war Rome in search of the La Dolce Vita. And Wall Street bankers made London their second home as the Big Bang deregulation of the 80s and 90s transformed London into a center of global finance. Now there is a fresh generation of Americans heading to Europe in search of personal and professional development. They want to go to business school, and see the shorter, internationally diverse MBA programs of the old continent as an increasingly attractive alternative for their resumes and bank balances. The GMAC Prospective Students Survey 2018 already captures the declining appeal of a US business school education among international students. Less than half (47%) of those surveyed stated a preference to study in the U.S., down from 56% in 2016, as Poets&Quants Editor-in-Chief John A. Byrne details in this piece. Among the same group over the same period, those preferring to head to a European business school has increased from 26% to 33%. But it is not just applicants from Asia, Latin American, the Middle East and Africa that are thinking twice about U.S. study plans. “We’ve seen a dramatic increase in interest for the top European schools from the U.S. market over the last eighteen months,” explains Caroline Diarte Edwards, co-director of Fortuna Admissions and former Director of Admissions and Financial Aid at INSEAD. “While the rest of the world has reacted to a changing political climate and concerns about visa opportunities in the U.S., a growing number of American applicants are looking to enhance both their personal and professional development with a more affordable international study experience. Nine of the top ten European business schools take part in the CentreCourt MBA Festival, which through September 2018 brings together 34 of the world’s top 40 business schools to meet with MBA applicants in cities across the US and Canada. All of them are reporting a sharp increase in demand from the U.S.
HEC Paris saw a 21% increase in U.S. demand in 2017, and the trend has continued with a 16% increase in applications in the first six months of 2018. For Banchereau the idea of studying at one of the top 5 European schools is on the radar screen of those who were unable to secure a place at Harvard, Stanford, Wharton and other M7 schools, but want an MBA from a globally recognized institution. Recently, many second-tier business schools have struggled in recent years to recruit candidates to their full-time MBA programs, while the more highly ranked MBA programs have generally reported ever increasing numbers of applicants to their programs. MBA applications at many of the most highly selective business schools in the U.S. are plunging, in many cases by double digits. An analysis of preliminary 2017-2018 application data by Poets&Quants reveals some shocking declines. At Rice University’s Jones Graduate School, for example, candidates to the school’s full-time programs plummeted by 27.7% to just 587 applications from 813 a year earlier. At the McCombs School of Business at the University of Texas-Austin, applications fell 19.6%. At the Kenan-Flagler Business School at the University of North Carolina-Chapel Hill, applicants declined by 18.3%. Applications fell 13.2% at Indiana University’s Kelley School of Business (see below table). Many schools have yet to release numbers, including Harvard, Stanford, MIT Sloan, Chicago Booth and Northwestern Kellogg, but declines are expected in applications to their MBA programs as well. Harvard Business School apps fell below 10,000 this past year, from a near record 10,351 in 2016-2017. Wharton has already disclosed a 6.7% drop in applications for 2017-2018. UC-Berkeley's Haas School of Business saw a 7% decline. Yale University’s School of Management applications fell 7.6% to 3,785 from 4,098. At the University of Michigan’s Ross School of Business, MBA apps are down by 8.5% to 3,188 from 3,485. At Duke University’s Fuqua School of Business, applicants fell by 6.2% to 3,557 from 3,796 a year earlier. AThe GMAC report found that 47% have a preference for the U.S. now, down nine percentage points from 56% in 2016. Meantime, Western Europe has become significantly more popular. Today, 33% of would-be, full-time MBA students prefer to study in Western Europe, up seven percentage points from last year’s 26%. In a single year, the European schools have closed the gap between them and the U.S. by an astounding 16 percentage points. The MBA Class of 2020 kicked off the fall semester in style earlier this month at Cornell’s Johnson Graduate School of Management. To formally welcome the new recruits to the Cornell community, Johnson Business Feed published a comprehensive class profile, shedding light on the students who make up the incoming class. 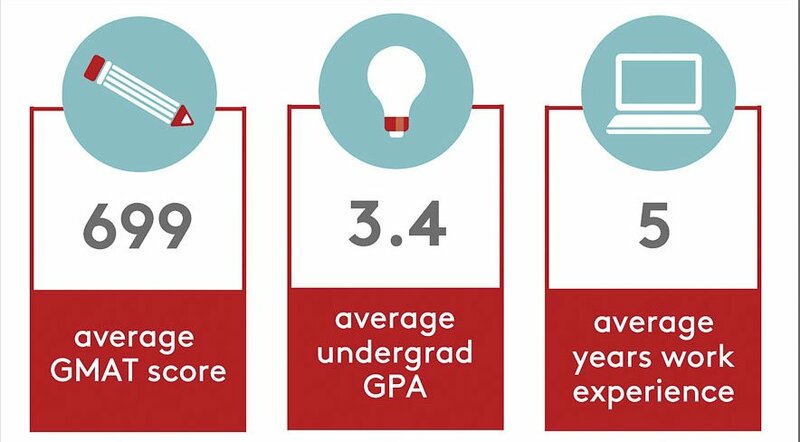 There are 280 students in the incoming students (up just slightly from last year’s 277), and they boast an average GMAT score of 699 and an average undergrad GPA of 3.4. That’s pretty similar to the Class of 2019, where average GMAT score was 700 and average GPA was 3.36. Average work experience also remained constant year over year, with incoming students bringing five years’ experience in the workforce to bear on their business school journey. Admissions Director Judi Byers and her team have been working hard to recruit more women to Johnson, and their efforts are paying off. Women make up a full third—33 percent—of this year’s incoming class, a six-point increase over last year. The percentage of underrepresented minorities (URMs) in the Class of 2020 also grew, from 12 percent last year to 15 percent with this newest class. In total, U.S. minorities make up 32 percent of the overall class. That figure includes Asian American, African American, Native American, and Hispanic American students. International students, though, dipped. International students made up 34 percent of last year’s incoming class, but this year they account for only 27 percent. Johnson, like many of its peer schools, experienced a drop-off in international application volume amid widespread concerns around possible U.S. immigration and work visa restrictions. Still, they will bring perspectives from 40 different countries to the Johnson classroom. That’s up from 38 countries represented in the second-year class. There are also fewer military veterans in this year’s class—7 percent as compared to 11 percent for the Class of 2019. In terms of undergraduate majors, former business students make up the largest slice of this year’s pie—29 percent. Social science majors make up the second largest group at 21 percent, followed closely by engineers, who comprise another 20 percent of the class. Humanities majors are in the minority: They represent just 10 percent of the Class of 2020. As for previous work experience, the vast majority of the incoming class—44 percent—falls into the category of “other.” According to Johnson, this includes students who have worked in the real estate, energy, nonprofit, and transportation industries, among others. Roughly a quarter of the class—23 percent—come from finance, and another 17 percent are former consultants. In an Instagram post, Byers shared that the Class of 2020 wasted no time getting into the spirit of things during pre-term week, adding to the school’s shared wall of values and expectations. Community, impact, collaboration, excellence, and teamwork were among those she chose to highlight. The University of Michigan MBA application is now live, for applicants targeting the Ross School of Business this 2018-2019 admissions season. This means that the Ross MBA recommendation questions are now available. Recommenders are asked to provide 50-500 word responses to three questions (in addition to a fourth optional response) about the applicant’s broad skills and receptiveness to feedback, to rate the applicant on a series of competency and character traits, and to offer some brief context about their relationship with the candidate. During which period of time have you had the most frequent contact with the applicant? If you are affiliated with Ross School of Business or University of Michigan, please indicate how. For each competency, please mark the one button corresponding to the behavior that you have seen the applicant most consistently exhibit. We acknowledge that all applicants have both areas of strength and areas of development. Your candid, honest appraisal will assist in evaluation of the applicant. Please assume that each level builds upon behaviors of the previous level. (Optional) Is there anything about your rating on the grid categories which you would like to comment? Based on your professional experience, how do you rate this applicant compared to her/his peer group? The Georgetown Institute for Women, Peace and Security (GIWPS) and the Global Social Enterprise Initiative (GSEI) at the McDonough School of Business have been awarded a $1 million grant from the Bank of America Charitable Foundation. This marks the second time the foundation has partnered with these two Georgetown entities to expand knowledge on workforce issues and women’s economic mobility. The foundation aims to help build thriving communities by addressing issues fundamental to economic mobility, including workforce development and education, basic needs, and community development. Ambassador and Executive Director of GIWPS Melanne Verveer says the grant will enable the development of major research on how to create economic opportunities for women in fragile states. It will also support a Bank of America Research Fellow for the 2018-2019 academic year, Raiyan Kabir (MPP’17), as well as a Research Fellow for 2019-2020. During the first phase of its research, GIWPS will focus on successful interventions to increase women's economic empowerment in conflict-affected nations. The study will launch at the Bank of America conference on women’s entrepreneurship in Dublin, Ireland, this fall. Bank of America’s past support to GIWPS contributed to the first-ever Women, Peace and Security index (link is external), which looked at three dimensions affecting women’s well-being – inclusion, access to justice, and security. The index ranked more than 150 countries based on factors such as women’s workplace participation, girls’ education, and freedom from violence and discrimination. Executive Director of GSEI Leslie Crutchfield says Bank of America’s grant will support a first-of-its-kind study of the breadth of social enterprise as an expanding field in the United States. GSEI will research social enterprise across the entire spectrum of purpose-driven companies, including those at the top of the business food chain, where large global companies use all of the company’s assets to advance causes and create shared value as well as small and growing enterprises. 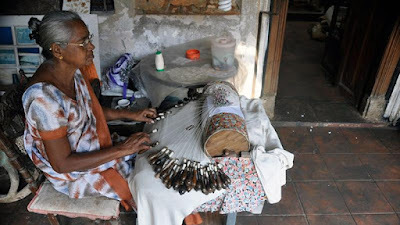 Some social enterprises, she explains, are designed to benefit hard-to-employ or vulnerable populations that have otherwise been excluded from mainstream economic systems. Enterprises may employ people with disabilities or recruit formerly incarcerated individuals, people without homes, and adults left out of quality education systems. Social enterprise businesses aim to create economic opportunities for marginalized workers, and at the same time turn a profit. Bank of America says the research will help further its work on advancing economic mobility, a core part of its focus on Environmental, Social, and Governance (ESG) leadership. In addition, the grant will help GSEI build a new rural prosperity initiative designed to drive private investment into low-income rural communities in the United States. It will also continue a dynamic leadership speaker series at campus events that has featured Chairman and CEO of Bank of America Brian Moynihan in conversation with Chairman and CEO of Berkshire Hathaway Warren Buffett, lead singer of U2 and philanthropist Bono, and American filmmaker Ken Burns. “We are very proud that Bank of America is our founding partner,” Crutchfield says. She explains that by clearly integrating Environmental, Social, and Governance into the way it does business, Bank of America exemplifies the core values that GSEI aspires to instill in students. INSEAD, the business school for the world, today announces the appointment of Don Tapscott, a leading authority on the digital age, as Adjunct Professor of Technology and Operations Management with effect from 1 September 2018. INSEAD has also agreed on a two-year partnership with The Blockchain Research Institute (BRI), a think tank co-founded by Mr. Tapscott. Blockchain is transforming business with far-reaching implications for the global economy and society. It is widely known as the technology that underpins Bitcoin and other cryptocurrencies, and is referred to by Mr. Tapscott as the “Internet of value.” Blockchain also holds great potential for many more applications such as secure and validated data transactions. These applications can strengthen and stabilize developing markets, which opens opportunities around the world. To prepare future business leaders to tap into the potential of this exciting emerging technology, the INSEAD–BRI partnership will advance research on the evolving blockchain technology and its impact on business and society. Don Tapscott is the CEO of The Tapscott Group and the Co-founder and Executive Chairman of The Blockchain Research Institute. He is a globally recognized thought leader in this field and the author of 16 books, including worldwide best-sellers Wikinomics: How Mass Collaboration Changes Everything and Blockchain Revolution: How the Technology Behind Bitcoin and Other Cryptocurrencies is Changing the World. 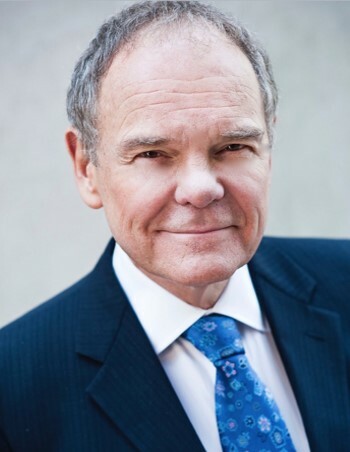 Mr. Tapscott is a member of the Order of Canada and ranked the number two most influential Management Thinker and number one Digital Thinker in the world by Thinkers50. Under the partnership, joint research, teaching, and seminars will be conducted to better understand how this technology can change the way organizations are managed and prepare business leaders for a new definition of competition. The partnership will also support the development of an INSEAD online programme for business leaders to leverage the possibilities and strategic value of blockchain technology. In addition to INSEAD's programmes on its three campuses, INSEAD participates in academic partnerships with the Wharton School of the University of Pennsylvania (Philadelphia & San Francisco); the Kellogg School of Management at Northwestern University near Chicago; the Johns Hopkins University/SAIS in Washington DC and the Teachers College at Columbia University in New York; and MIT Sloan School of Management in Cambridge, Massachusetts. In Asia, INSEAD partners with the School of Economics and Management at Tsinghua University in Beijing, and China Europe International Business School (CEIBS) in Shanghai. 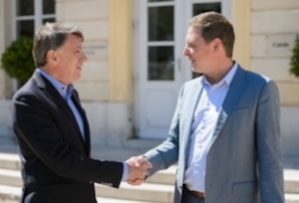 INSEAD is a founding member in the multidisciplinary Sorbonne University created in 2012, and also partners with Fundação Dom Cabral in Brazil. Around the world and over the decades, INSEAD continues to conduct cutting-edge research and to innovate across all its programmes to provide business leaders with the knowledge and sensitivity to operate anywhere. These core values have enabled us to become truly "The Business School for the World”. PHILADELPHIA, PA, August 23, 2018—The Wharton School of the University of Pennsylvania and INSEAD are pleased to announce the renewal of their strategic alliance through June 2021. Established in 2001, the Wharton-INSEAD Alliance combines the resources of two world leaders in management education and creates global access to unparalleled business knowledge for students, faculty, and executives worldwide. Six Campuses. Two Schools. One Alliance. The Alliance reaffirms both schools’ commitment to cultivate market leaders through management education, and to contribute towards global business research and education for businesses and communities worldwide. So far, more than 1,700 MBA students and executives have benefitted from various programmes and collaborations across the schools’ six campuses in Philadelphia, San Francisco, Beijing, Fontainebleau, Singapore and Abu Dhabi.